Asa Products is a leader in the active, outdoor category thanks to our award-winning line of three-wheeled Mobo Cruisers. We provide customers of all ages a comfortable, easy to ride cruiser that encourages a fit and fun lifestyle. All Mobo Cruisers feature our patented unique steering mechanism and adjustable frame to make riding comfortable and relaxed and delivering a next level riding experience. With our patented three-wheel design, we strive to offer that “wow, wow, WOW”, experience for the whole family! Asa has been in the active lifestyle products business for over 20 years. Asa Products, Inc. was established in 1998 as a Minority and Female Owned Business Enterprise. 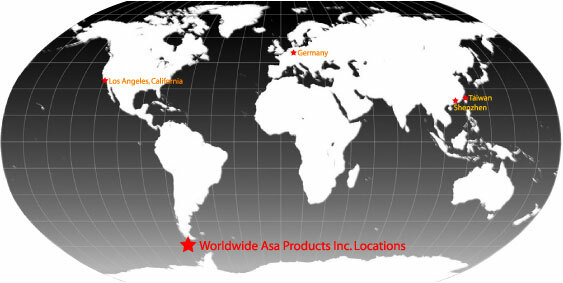 Asa is globally recognized with satellite offices in Taiwan, China, and Germany. Asa has used the wisdom and experience gained in its success in business and its commitment to build strategic alliances, strong brand recognition and substantial good will with consumers. It is the mission of Asa Products to provide a "WOW, WOW, WOW" experience through our service, innovations, quality, and style. Our number one priority is to develop and deliver products that improve the lives of others and encourage a fit and fun lifestyle. To become the global leader within the active lifestyle product industry through luxury brands, stylish and innovative products, and creating a wow experience in people's lives. Asa promises to provide superior family friendly and accessible customer service in its effort to achieve 110% customer satisfaction and Wow experiences. Asa also promises to bring the most innovative, stylish, compelling, high-quality and family oriented products to the market that improve the lives of and completely delight consumers. We only work with innovative high quality products that meet the very highest standards in excellence in manufacturing. Asa promises to deal fairly and honestly with business partners to develop and administrate superior business solutions that accommodate mutual success. We are fanatical about ensuring the success of our partners. We have earned and maintained the trust of some of the largest national retailers for long term business relationships. Asa promises to provide a culturally diverse and team-oriented workplace that is friendly and fosters goal oriented teamwork, mutual success and growth. Asa encourages a fun & fit culture through fitness challenges and supports the continued educational advancement of its team members and offer a variety of benefits and perks. Asa promises to be a socially and environmentally friendly commercial organization which supports charitable organizations and community improvement programs on both a local and national levels.